Rainie Nelson (third from left) is shown with the other finishers in the top three and the judges in Iowa State’s 3-Minute Thesis final competition. 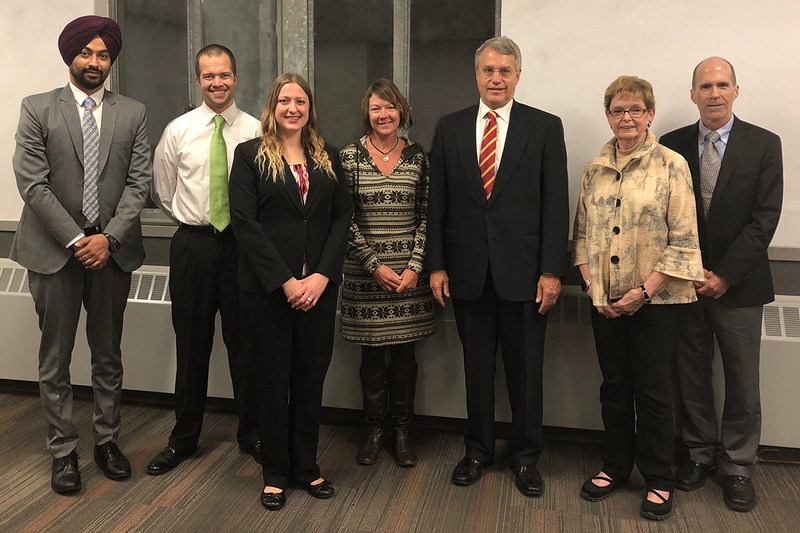 Chemical engineering graduate student Rainie Nelson has taken first place in Iowa State’s final round of the 3-Minute Thesis (3MT)® competition, coordinated by the university’s Graduate College. Presenting “Shining a Light: The Power of Perovskites” with the three-minute clock ticking, Nelson garnered the highest score from a panel of judges rating presentations from eight ISU finalists. With the victory, Nelson qualifies for the regional 3-Minute Thesis® competition at the Midwest Association of Graduate Schools Annual Meeting March 20-22, 2019 in St. Louis, MO. Nelson’s project deals with the development of new materials for solar cells. She currently works on lead-free halide perovskites. Traditionally, a perovskite is a material with a cubic structure that contains three different elements. Lead containing perovskites have been used in very efficient but unstable solar cells, so Nelson is trying to replace lead and make the material more stable. Nelson studies under the Department of Chemical and Biological Engineering’s Dr. Matthew Panthani. Her “Meet The Contestants” video submitted prior to the 3-Minute Thesis® competition can be viewed here. Developed by the University of Queensland, the 3-Minute Thesis® requires students to clearly summarize a research project within the constraints of a three-minute time limit using pre-determined guidelines. The premise addresses the topic of training university students to develop important oral communication skills that can allow them to briefly explain their research to any educated layperson. 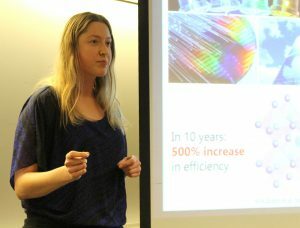 Nelson presenting her perovskites research project in the Department of Chemical and Biological Engineering’s “Perfect Pitch” competition in early 2018, where she also took first place. “I really enjoyed competing in the 3-Minute Thesis® event. I think 3MT is a wonderful opportunity for graduate students to consider the broader impact of their research and to simplify that research so they can share it with a diverse audience. It’s also very interesting to hear about research being conducted in various departments on campus; the other graduate students did a wonderful job in sharing their work and it was a pleasure to learn from them,” said Nelson. Nelson’s presentation also took first place in a Department of Chemical and Biological Engineering competition in early 2018 called “Perfect Pitch,” where all chemical engineering graduate students were required to present their research under similar rules, but in a time span of only 90 seconds. The 3MT judges also select an Honorable Mention and People’s Choice Award winner at the ISU competition. In the 2017 competition chemical engineering graduate student Anuraag Boddupalli won the People’s Choice Award. His video and others from 2017 can be found on the ISU Graduate College web site here. A video of Nelson’s winning presentation and of the other 2018 contestants will be available soon through the Iowa State Graduate College.